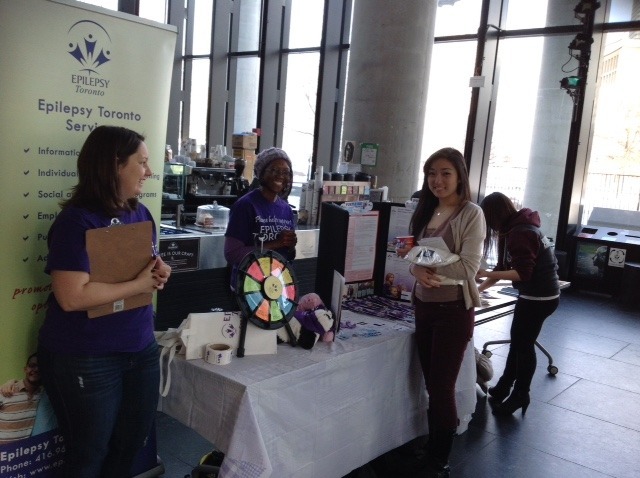 Epilepsy Toronto strives to eliminate the stigma surrounding epilepsy by providing a range of public outreach programs to diverse communities. We facilitate workshops at Community Health Centres, newcomer settlement agencies, education/religious institutions, cultural associations and community groups to promote a better understanding of epilepsy in the community, and address current needs and barriers to accessing Epilepsy Toronto services. Presentations have targeted Seniors, Mothers & Babies, Case workers/Health Care professionals, Aquatic Leaders and Newcomers who have represented the Somali, Tamil, Bengali, Caribbean, Chinese, Spanish, Italian and South East Asian Communities. 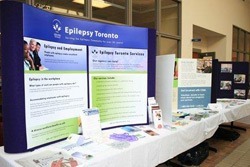 Epilepsy Toronto is committed to extending outreach and strengthening community partnerships. Epilepsy Toronto provides information on epilepsy to over 100 organizations each year, including schools, corporations, health organizations, and social service agencies. We’ve provided Seizure First Aid training to Toronto’s Police force, working closely with the officers to improve their response to a person having a seizure in a public place. Knowing how to distinguish a seizure from intoxication is one of the important issues we discuss with the police personnel. Through our public education program, we aim to dispel the myths about seizures and epilepsy that so negatively impact the quality of life of people living with this condition. Epilepsy Toronto provides training in epilepsy treatment to care givers and students enrolled in courses at George Brown College and Seneca College where they will eventually work with people who have seizures. We also provide Epilepsy 101 presentations to school children and teachers that raise awareness about epilepsy. On a personal level, we can provide educational presentations to a family, neighbours or even a landlord if a client indentifies the need to have better support from the people in their community. Or learn about our Teaching Awareness Through Puppetry (TAP) workshops by clicking here. 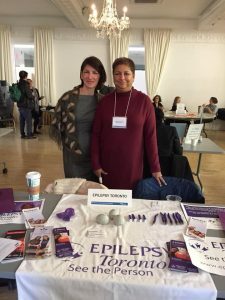 Epilepsy Toronto works at forging strong relationships with the media, constantly seeking opportunities to bring epilepsy into the public eye. Through our annual summer festival, BuskerFest, we find many avenues to talk about epilepsy in the newspapers, radio, television and through social media. BuskerFest is consistently attended by over 1 million people a year and is the world’s largest epilepsy awareness event. Starting in 2015 Epilepsy Toronto organized Toronto’s first Purple Walk for Epilepsy to raise even greater awareness. Now every year, close to a 1,000 people march through Toronto’s downtown core, spreading pride and awareness about epilepsy. March 26th is Purple Day, Epilepsy Awareness Day and for that event Epilepsy Toronto has organized numerous school activities, an epilepsy information seminar with Toronto Western Hospital, a human purple ribbon event at Nathan Phillips Square and many other activities designed to bring epilepsy out of the shadows. Knowledge is indeed empowering, and an educated patient is a healthier one. People with epilepsy come to us needing information about the causes, diagnosis, and treatment of epilepsy, the management of seizures and the side-effects of anti-seizure medications. There are more than 40 different kinds of epilepsy, and new information about each type is coming to light all the time, along with new medications, surgeries, diets and other treatments. At the same time, medical specialists in our health care system have less time than ever to explain and discuss complicated matters with their patients and their families. Being fully informed about epilepsy is key to being able to live successfully with this condition, so we offer many different opportunities for our members to learn more about epilepsy and to stay current. We maintain online resources and reports on the latest developments affect our community and our newsletters keep our stakeholders up-to-date. The program connects volunteer ambassadors with organizations for informative presentations which shed light on the benefits that people with disabilities bring to the workplace. Presentations can be customized and can include an overview of epilepsy, seizure first aid, resources, personal accounts and stories. communications skills and boost their confidence while educating companies and employers on the benefits of workplace inclusivity. to deliver. This is an invaluable opportunity to help promote diversity, inclusion and eradicate stigma, while developing employable skills. our Ambassadors, who educate while sharing personal stories. Those attendance will gain insight into the benefits of hiring and working alongside people with a disability.